Civil Marriage procedures in Turkey are more easy and finished in half a business day compared to other countries providing civil marriage. Our company Wedding City Antalya offers the fastest wedding service and wedding packages with the most attractive prices according to your budget. Civil Marriage in Turkey: Our company Wedding City Antalya has the knowledge and experience to organize the civil marriage for every citizens of the world. The given marriage certificate in turkey, is internationally recognized and multilingual. For the satisfaction of the couples and their guests, the Civil Marriage can be conducted by the Registrar at the desired Wedding Venue. We will provide you in writing the legal requirements for marriage you need to prepare in your country. Please send us the above documents obtained from the relevant authorities of your country by e-mail at least 30 days before coming to Turkey, so that we will check them all beforehand. You will need to take the original documents with you and submit them personally. The couple will be taken to the Marriage Office in Antalya to apply personally for the civil marriage with filling out the document of “PERMISSION TO MARRY/DECLARATION OF MARRIAGE”, Health certificate will be taken. At the day of application our clerk will take the couple from the hotel with a car, assist them with all the paperwork and will bring the couple back to the hotel after all the paperwork is done. The registrar will be brought to the marriage venue. 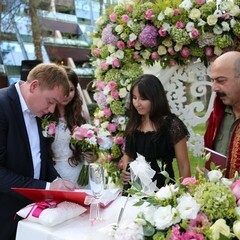 After the civil marriage, the marriage certificate must be apostille by the Office of the Governor in Antalya. There is the mosque for Muslims, the church for Christians, the synagogue for Jews at the Garden of Tolerance in Belek / Antalya. If you bring the required documents from your country, your religious marriage ceremony can be held in the Garden of Tolerance. 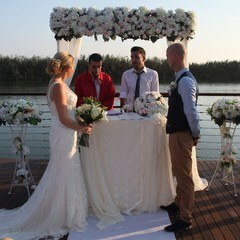 We can organize your religious marriage ceremony at catholic church in Antalya. The priest doesn’t go to the hotel for the religious Marriage Ceremony. We can organize your religious marriage ceremony at Protestant Saint Paul church in the historical old town of Antalya, called Kaleici. It is possible to perform the religious ceremony in the hotel or at any other desired location. 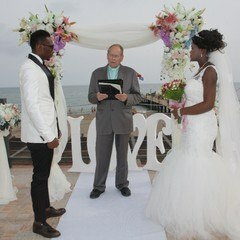 The Religious Wedding Ceremony by the Priest does not have to be in the church. Although there is an orthodox church in the Old Town of Antalya (Kaleici), unfortunately, a orthodox wedding ceremony is not possible here. This is not approved by the Patriarchy in Istanbul. It is required, that the orthodox marriage is to be conducted at the orthodox church in their home country. If you want to have a fabulous wedding, organized flawless by our friendly and professional team, than trust us and inform us about your dreams and we will create a memorable and meaningful wedding day for you and your guests, that you will remember forever. Enjoy a sumptuous and perfect wedding with your family and friends. Your dreamed Wedding can be true through mutual negotiations and correspondence with our specialized team in wedding planning. Together we can create a fairytale wedding. Balloons, Candles, flambeau, torch, wish lanterns, special animation costumes, accessory etc. Wedding& Marriage ceremony at the cave of the biggest underwater Aquarium in the world.